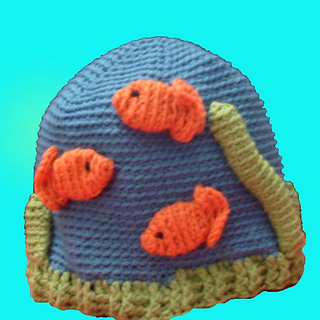 This is a cute ‘under the sea’ hat, featuring little fishies and seaweed. This hat has a ribbed brim, meaning it fits snug to keep the winter cold out. This pattern contains 4 different sizes, ranging from child to adult. In addition to hook and yarn, you will need a tapestry needle and a bit of black embroidery thread. As always, the pattern comes with progress photos, and you can always email me for help.